EUGENE — The entirety of the season, senior Cole Thomas and junior Izabela Kacalek left no doubt that they were among the top echelon of distance runners in the Three Rivers League (TRL). Both qualified to return to the state meet at Lane Community College (LCC) in Eugene. For Thomas, his return marked his third attempt at the course; for Kacalek, it was her second. In his most recent outing at LCC, Thomas came in 64th place out of 155 competitors with a time of 16 minutes, 48 seconds (16:48). The time was well short of his personal record of 16:12, set last year in a league dual meet, and his placement was well back of his outing last year. In the 2017 showing, Thomas placed 33rd overall. He did not hide his disappointment after the fact. "In all honesty, I was very disappointed with the results from the state meet," Thomas said to the Herald via text message. "I fell short of a lot of the goals I had set for myself when I was an underclassmen. I would have liked to place higher, but occasionally you're going to have bad races. Unfortunately, my bad race happened at state." One factor that may have affected his performance in Eugene was that Thomas was battling a sickness in the leading up to the meet. However, Thomas was sober in his post-race assessment. "Even if I was completely healthy, I still probably wouldn't have placed as high as I would have liked," Thomas said. "I have to pay respect to the other competitors. It was overall the fastest state meet I have a part of by far." Over his distance running career, Thomas claimed four first place finishes in league competition, and consistently finishing in the top five spots for the boys team. In the 2018 season, he led the boys' team to a fifth place finish in the TRL with a 109 point total. Though his time racing for the Canby cross country team may be done, he does take some lessons out of the time spent racing in the blue, white, and gold. "Distance running has taught me the work ethic required to reach your goals in life," Thomas said. "However, running even more so taught that it is less about winning races, and more about the relationships you build with your teammates, coaches, and competitors." 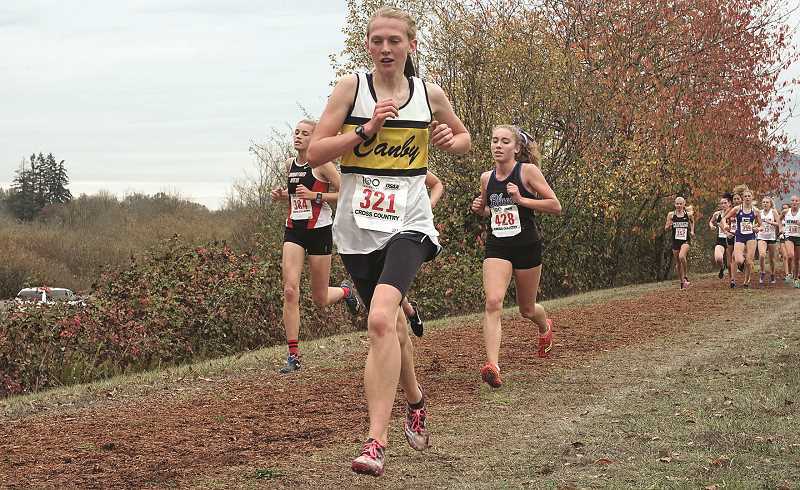 For Kacalek, the junior in just her second season of running cross country for Canby, the race yielded a more positive emotional response. Kacalek finished 21st overall on the girl's side of things with an 18:37 mark (a personal best). "I am very happy with my race," Kacalek said. "The state meet is what my coaches and I have been training for, racing against the top runners in the state. Last year, being around so many state runners was overwhelming compared to dual meets, but this year I used that to my advantage with pace and moving forward." The return trip to Eugene helped Kacalek game-plan for a better result with her coaches, and the results speak for themselves. In last year's 6A state meet, Kacalek finished in 59th place with a time of 19:52. After working out the nerves and honed in on running her race, Kacalek shaved more than a minute off of her final time. It was part of a trend of growth for the distance runner, who said that growth with her teammates was part of the norm over the past season. "I have cultivated so many more new relationships and strengthened past ones," Kacalek said. "I am so proud of the program with what we have accomplished. We have coaches that care deeply for their athletes and commit their time to knowing us personally."